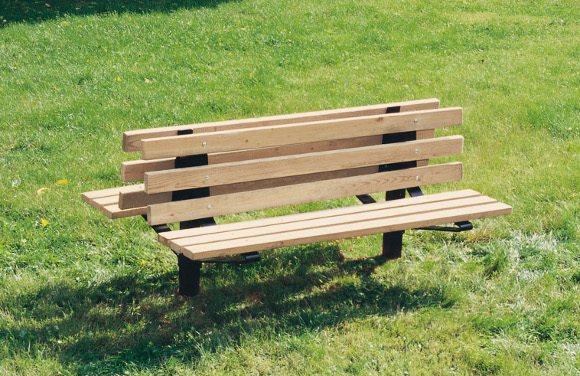 The Bollard Style Double Sided Wood Bench is a great site furnishing to add to any park or playground with multiple areas of recreation. It allows patrons to rest while keeping an eye on the action in either direction, a must for parents or guardians taking their kids to play. Just locate this bench in the middle of things and they'll look on in appreciation. The seat and back planks are made from comfortable and classic looking 2" x 4" planks made of untreated #1 Southern Yellow Pine that have been sanded smooth and made safe for use by all with rounded edges. Customize this site furnishing to match your commercial playground equipment with one of several powder coat colors that protect the tube steel frame, or keep it classic with an unfinished look of the bare galvanized steel. The hot-dip galvanization process still protects the life of the metal because it's coated inside and out. The bare steel is covered by a 99.99% Pure Zinc layer that is then covered with layer of enhanced conversion coating, and then a clear polymer coating. These provide excellent abrasion resistance and increases the life of the steel. If you choose a powder-coat color you'll end up with a five layer processed frame that protects from harmful environmental elements, leaving you with very little maintenance. Dimensions: 72"L x 34-1/2"H x 52-1/2"W, 18" seat height. 2x4 untreated wood plank with rounded edges. In-ground and Surface mount options available. 3 x 3 square tube frame with 3/8"x3" flat plate seat supports, all MIG welded. Five layers of protective coatings for durable outdoor protection and abrasion resistance. Choose from 11 colors of standard powder coated frames. Photo shows 6' In-ground configuration with black powder-coat finish. American Parks Company is a recognized brand leader in quality outdoor park and recreational site furnishings. We offer durable products to help you build your commercial park or playground. 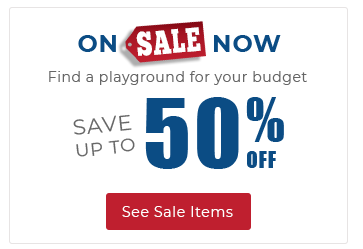 Call a playground specialist at 1-800-381-4491 to start planning your outdoor space.